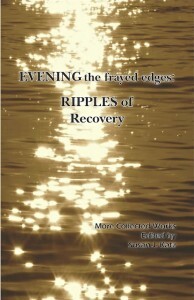 EVENING: the frayed edges, RIPPLES of Recovery, released in April 2012, is the second anthology by the Vancouver-based Recovery Narrative Project. The Recovery Narrative Project is a peer-led writing circle for mental health consumers who wish to share their stories of strength and recovery. Authors of the second anthology include Jude Swanson, Margo Robinson, Susan J Katz, Susan Trapp, and Zerom Seyoum. For more information, please visit the Recovery Narrative Project’s blog.